“Let our youths know that there is a law that will take them to prison for disturbing property developers, we pray for those who will be the first set of people to flout the law”, the Delta State governor, Ifeanyi Arthur Okowa, has threatened youths across the state. 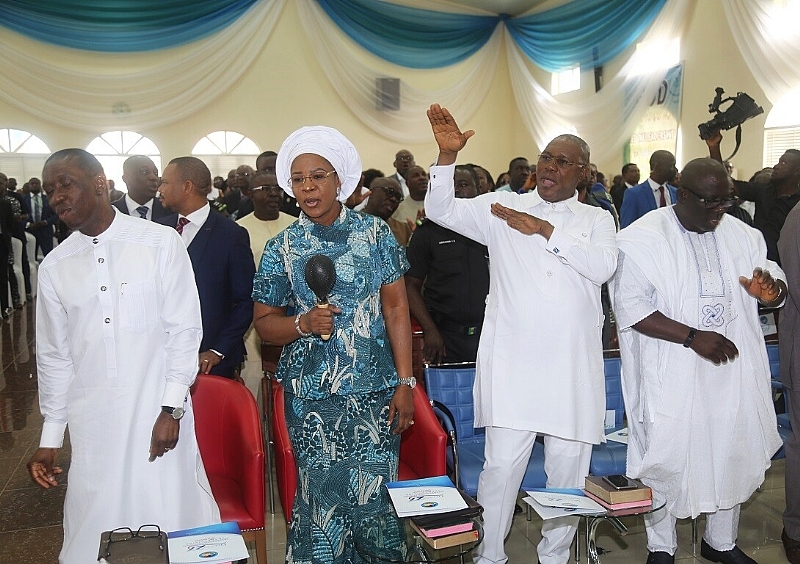 Meanwhile, Okowa said, “There is a lot of reason to thank God; if you can recall when the state was created, you knew how the state was, but the peace that we witness today is more than enough reason to thank God. “The peace that we witness in the state today does not just indicate peace alone, but proof that we are united, our traditional rulers are united and they are speaking with one voice; it was not so in 1991, but we thank God for where we are today, you can feel the impact of that unity and peace in the state. “We have come to realize that we are one people and that we have to work, grow and think together and that whatever development will come to this state has to be one in which it involves everyone and I give God all the Glory. We will continue to do the best that we can to make our state better”, he added.